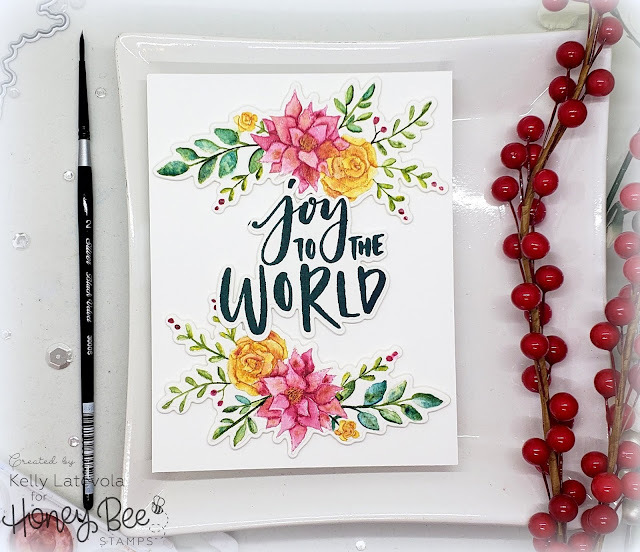 I'm super excited to be part of a Special Christmas feature Honey Bee Stamps is doing. I am designer #4 of the 12 days of Christmas!! Besides the amazing inspiration you'll get from a different crafter everyday there's also some awesome deals. First things first the stamps and dies I used today are 10% off! Second Honey Bee is generously allowing me to give away a $25 gift card here on my blog! Leave a comment telling me your favorite Christmas tradition! 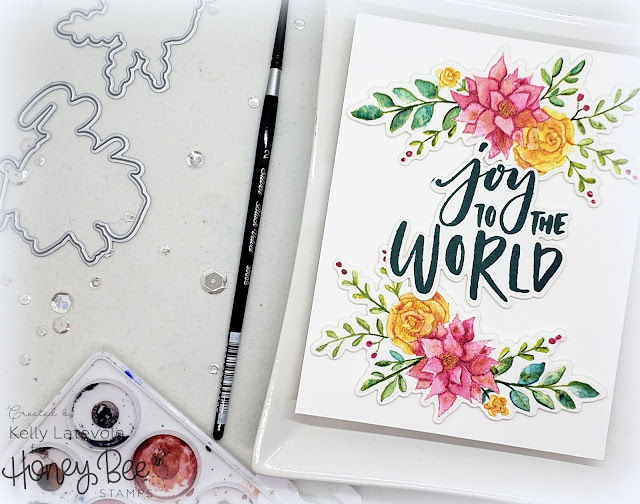 Last but not least, they are giving away this gorgeous rejoice stamp set over on their blog to one lucky commentor! I really love the versatility the dies give you with this stamp set. I completely rearranged the stamp layout and I love it! I stamped the image in Fadeout ink and watercolored with my Daniel Smith watercolors. It was a little time consuming but totally worth it. I like to lay down a layer of color, then blot the bottom bristles on my brush before taking the damp brush to the paper and pulling out the color. I like to add drops of other colors inside the petals too. I think it makes it more interesting to look at. I love that these flowers can be used all year round and not just for Christmas. Since you can cut them out individually it makes it really easy! Love this set. Love this card. Gorgeous stamp set and awesome colouring Kelly, love the card. 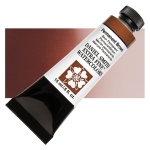 when I watercolour (I only do that with my Distress Inks) I also use a very small brush, I want the control LOL, same as you and it doesn't matter. Everyone does it on her/his own way. Storytime - no I don't like black trees, here ( the Netherlands) I didn't see them yet. I can imagine a black tree with gold but only in a huge space like a big hall from a officebuilding. Something like that but for in the family house, I am more of a traditional girl. Thanks for this gorgeous piece of watercolouring and until the next time. beautiful card! Love my "family" very traditional Christmas tree. Would hate a black one! Our's is filled with ornaments that are multi=generational. Have a great Christmas! Really enjoyed seeing your watercolor process. I am also learning to watercolor--it's all about the water! One of my favorite traditions is wrapping presents with my husband. We put out a fold up table, a selection of wrapping paper, 2 tape dispensers, 2 pens, 2 scissors, and tags. Usually we put on a funny video and/or talk while we wrap gifts for the family. It makes us happy. Beautiful as always, thanks for the inspiration Kelly. Gorgeous card Kelly. This spray of flowers could be used for any occasion. Another fabulous idea from Honey Bee! I’m with you on the black Christmas tree, just wouldn’t work for me. I love all the handmade colourful, glittery decorations, lots of pretty lights and that sort of stuff. Very beautiful! A tradition I did when I was younger was riding around neighborhoods looking at Christmas decorations with my parents! Now, first off, i had never heard of the technique you used, gonna tty it, as my watercolor always gets waaaay outta hand. Second: the tradition: what you don't know is that i am a retired pastor, so i raised my kids while serving churches in rural New England. My favorite traditions are Christmas Eve: dinner is mac and cheese out of a box, cuz mom (me) is SUPER busy. In between kids' service and midnight candlelight, we each open 1 present, "to tide us over." Sometimes it was socks. Sometimes it was a game for everyone. On Christmas morning, all kids sit on the stairs and eat 1/2 pb &j sandwich and a glass of milk, then it's presents and candy and cookies and sleep and giggling for the rest of the day. The one day a year rhey could have as much sugar as they wanted. They're all grown now. I miss the chaos and the giggles. Lovely! Favorite tradition would probably be making a huge breakfast Christmas morning after the gifts are open (just not something we usually do) or Mazzone's pizza on Christmas Eve. And I have a small black feather tree that comes out for Halloween but I don't think I could get on board with that for Christmas. I'm trying to find a new word to express how gorgeous your creations are, but none measure up... You are such an inspiration! We are game players at Christmas - board games, "minute to win it". Lots of laughter! 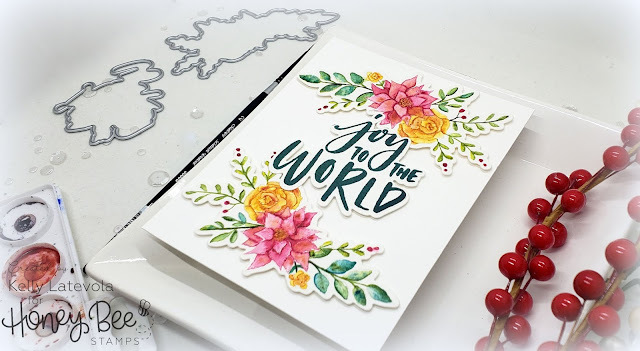 This is a gorgeous card Kelly, as always I have learned something more here in watching your video. I am certainly a novice at water colouring (it doesn't come naturally to me), so I am slowly learning/retaining information. First of all, it's so great to have Kelly back!! Secondly, BEAUTIFUL card!!! One of my favorite Christmas traditions of playing a silly game with all of the family. So many laughs!! What a beautiful card! I can't wait to watch the video for all the usual great tips. My favorite holiday tradition is loading up the whole family (dogs too) and driving around looking at the holiday lights. Excellent card, Kelly, beautiful painting! And thanks for "Santa Secret Shop" memories! Our family tradition is watching “national lampoons Christmas Vacation “ on Xmas eve, and preparing Christmas Morning Wifesaver to enjoy on Xmas morning! Absolutely stunning card Kelly!! My favorite tradition is making ornaments with my boys. We have done it every year since my oldest son Braxton was born. So 11 years now. They make 3 ornaments each, one for our tree, and one for each set of grandparents. It is always so much fun and they decide how they wanna decorate them each year, depending on what they are into that year. Fabulous keepsakes and wonderful memories!! Thanks so much for the inspiration!!! Love ya bunches!! Big Hugs!!! Beautiful card! I am also a controlled watercolorist! Wait, that doesn't sound quite right. Oh,well you know what I mean! It's how I've always watercolored. Your flowers are really lovely! My favorite Christmas tradition is making with all my family the Xmas tree on December 8th. In Italy, this day is the start of holiday season. I love also spend most of the evening baking traditional Xmas cakes and biscuits with my mum and my grandma. My favorite Christmas tradition is getting the extended family together on Christmas Eve. We have finger foods, great music, and exchange gifts with each other. Then Christmas morning is for the immediate family. I love how you made a very festive, yet un-traditional Christmas card. It is awesome! 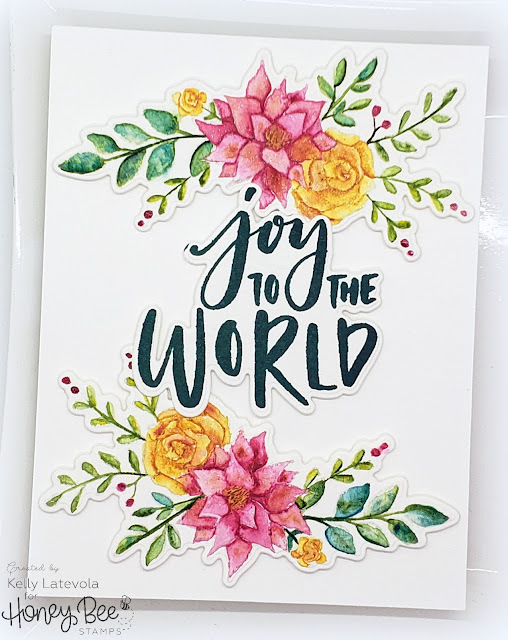 Such a lovely floral spray and your coloring has showcased it beautifully. We don't do many traditional things for Christmas, but my daughters and I make a super Shepherd's Pie every year. That's really nice! Thanks a lot for sharing your ideas! Beautiful card! Your beautiful flowers are truly lovely! I am pushing myself to use watercolor on my cards. I like how you had the flowers separate. I tried it and thanks for the idea. My cards thank you too. LOVE your BEAUTIFUL florals, FABULOUS colouring and ELEGANT design! Out tradition is to watch Carols By Candlelight on Christmas Eve then have all the families gather together for lunch on Christmas Day. Looks & sounds like we paint the same way, tiny & very controlled. But you're comes out pretty & mine looks like a toddler did it. Right black Xmas trees, been there done that but when it wasn't a trend, I was a serious goth child, black clothes, black make up, black everything including the mini tree in my bedroom. Now my son is doing it so they still get to see one but the family tree is green with pretty colours. Hi dear Kelly , first of all I hope you spent a very merry Christmas! Dropping by to know if the winner was announced. Thank you in advance!